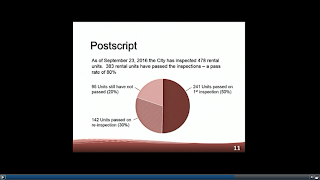 Before the committee of the whole of the Bellingham City Council on 26 September, the planning director presented a "correction" to the figures on the pass/fail rate of rental units inspected over the previous three months in the Sehome neighborhood. In fact, the figures presented differed little from previous reports. (see my prior column on these statistics here) The new figures were 242 passed and 239 failed with a fail rate of 50%. [The minor differences from previous figures of 231 and 237 respectively are due to constant updates as new units are inspected each day.] The director's report (see pie chart) goes on to say that after a SECOND inspection, another 142 units passed. The claim then was that 80% of our rental stock inspected to date passed! Woohoo! This is true but terribly misleading since the initial failure rate was 50%. With the logic of the pie chart pictured above, the passing on a second inspection of the remaining 95 failed units would bring the failure rate for our rental stock to 0% when, in fact, the initial go around was a miserable 50% pass rate demonstrating the true condition of the rental units before any inspections whatsoever. This wretched failure rate should bring a collective gasp of dumbfoundedness to the city of Bellingham. This leads us to the incomplete. Even more alarming was that there was no specification that 310 rental units (35%) of the 880 units in Sehome are being inspected by private inspectors. The use of private inspectors is allowed by state law, however, at the moment there appears to be no means by which the city can compel the private inspector to turn over the actual inspection sheet. All the city receives is a "pass" document, attested to by the inspector. There will be no indication about the number of failed inspections made before the pass attestation is given to the city. This not only paves the way for shenanigans on the part of the landlord (inspector-landlord collusion) but it also deprives the city and, more importantly, the tenants of vital, detailed information regarding the problems found within the rental units. [To date there has been no indication of any collusion.] Nevertheless, the 310 units (35%) in Sehome to be inspected by private inspectors leaves an enormous lacuna in the information on deficiencies available to the city. Furthermore, the city is finding that landlords using private inspectors tend to be the large management/real estate firms, many of which have checkered histories in dealing with tenants. This is unacceptable. The planning director indicated that the city is awaiting a legal case now in Seattle that may clarify the private inspector issue and its consequences. After the York neighborhood the city will move south to Happy Valley and then finish the south end with South Hill, Fairhaven, Edgemoor and South neighborhoods. An explanatory map of the inspection zones can be found here. Bellingham's war on slum housing has just begun and in the first round of rental inspections since June 1 in the Sehome neighborhood the enemy has been rousted. Out of the dark corners, hidden from the public eye emerges the truth about Bellingham's dirty little secret: Slum landlords are alive and thriving. Although landlords have had about two years to fix up their units since the rental inspection ordinance was passed, a shocking 50% [corrected]of the units (according to the city's preliminary figures below) failed their initial inspection. Even the ones that passed had some "conditions" at the initial visit. This demonstrates the arrogance of landlords who, knowing that inspections were coming, did nothing. After years of ignoring basic health and safety standards they, as business owners, are now being held accountable to business standards for the very first time! Here is the preliminary breakdown for the Sehome neighborhood where inspections officially wrap up at the end of September. Advocates for the new rental inspection program challenged the city and the rental industry to prove us wrong. Local anti-inspection landlords said their industry was better here. They promoted that myth during a long 15-year battle against implementation of inspections and registration. Unfortunately, the claims of those supporting rental inspections for the last decade or more were born out in this first round of code enforcement. Fortunately the Bellingham City Council finally, albeit for some members very reluctantly, bit the bullet two years ago and created an ordinance to inspect rental units and ensure the health and safety of half of the city's residents, tenants. The war on slum housing has just begun. The faulty wiring, bad plumbing, infestation of rats, leaky roofs, mold and unsafe structures are finally being exposed. Bellingham's liberation from its dirty little secret has just begun. It will be interesting to see how the "rental industry" leadership responds to this, if at all.